While the Citadel’s small stage uses a simple set, the director uses the entire theater to move the actors around, creating a much greater impact. No matter. The show is all about the upbeat music of Andrew Lloyd Webber and lyrics by Time Rice – and their music carries the show. Popular songs like “Close Every Door,” “One More Angel in Heaven” and “Go, Go, Go Joseph” had the audience singing along. Hours later, those tunes still resonated in my head. Joseph is played by the handsome Jacob Barton, a bit reminiscent of Donny Osmond. Barton has a wonderful voice and the stage presence to carry the range of character as Joseph grows and matures over 20 years. Jointly playing the Narrator are Carmen Risi and Laura Thoresen who play off and complement each other’s powerful voices. J.P. Thomas is hysterical as Pharaoh a la Elvis, as well as the despondent Jacob, Joseph’s father. The play is directed by Robert D. Estrin, a frequent Citadel collaborator, with musical director Ryan Brewster who conducts an off-stage live band. Choreographer Jake Ganzer beautifully manages the movements on stage and throughout the theater. “Joseph” is a perfect holiday show for the whole family and has everything to keep the kids engaged throughout the performance. The tale of “Joseph” and his 11 brothers isn’t staged very often in the Chicagoland area. Don’t miss it. 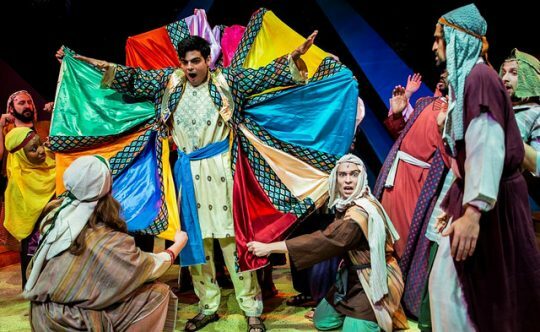 DETAILS: “Joseph and the Amazing Technicolor Dreamcoat” is playing at Citadel Theatre, 300 Waukegan Rd, Lake Forest through Dec. 23, 2018. Running time: 1 hour, 40 minutes with one intermission. For tickets and other information, call 847.735.8554 or visit Citadel Theatre.